This Texas-Italian inspired stall brings together the heritage of The Glossermans - Marc’s Texan roots and Kristen’s Italian - and is named for their oldest son Austin who was born opening night of their first restaurant. Austino’s serves pizza with a Hill Country twist. Pies include the “El Original” with brisket, mozzarella, green onion, pickle, jalapeno and El Original Sauce as well as a “Skye Pie”, named after one of their daughters, which is topped with Kreuz sausage, cippolini onion, roasted red peppers, mozzarella and red sauce. The Bluebonnet of Texas is more than a state flower, it’s a springtime tradition and cultural icon across the state. Bluebonnets at Hill Country Food Park was created to celebrate Texans’ love for their state’s natural beauty through its Farm-to-Table options, partnering with local New York purveyors to serve offerings from across the state. In a nod to beloved country-music icons, Bluebonnets features salads like the “Shania” with crisp romaine, pepitas, parmesan garlic crostini, caesar anchovy dressing and sandwiches like the “Reba” with mozzarella, portobello mushroom, roasted red peppers, arugula, pecan pesto, olive spread, hot pressed on ciabatta. 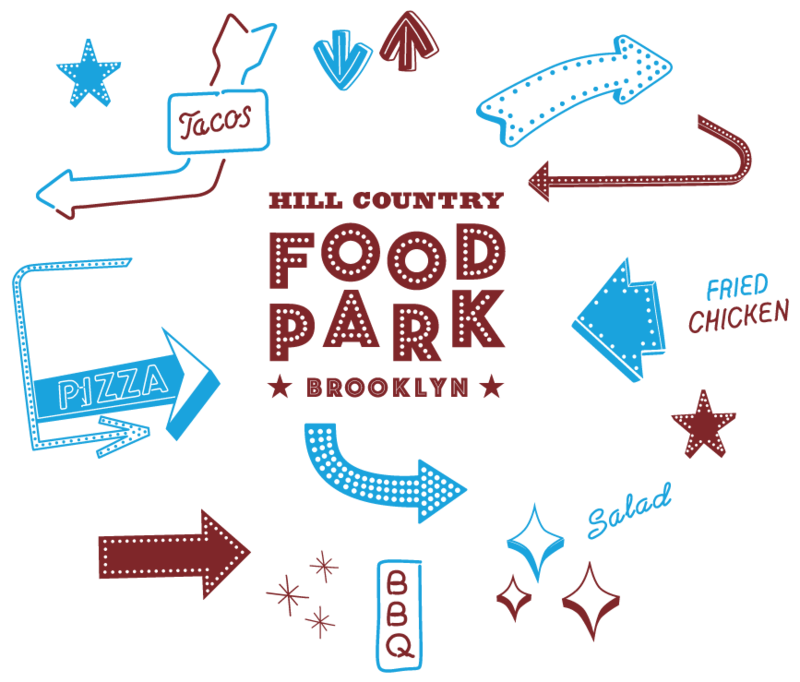 The New York City landmark that is Hill Country Barbecue brings its best to Food Park, continuing the post-oak cooking style the Hill Country region of Texas made famous. Available by the pound or on sandwiches, Hill Country Barbecue offers the lean and moist brisket that put NYC’s barbecue scene on the map, as well as venerable Texas-imported Kreuz Market sausages, house-smoked chicken wings, and baby-back ribs available by the half-rack. A fried-chicken mecca for New York City, this outpost of Hill Country Chicken features its classic bone-in chicken and massive “Mama-Els style” Texas tenders. The stall also offers sandwiches like the spicy “Wickedwich” slathered in Hill Country’s Wicked Sauce and topped with Pepper Jack cheese and the original “Chickwich” with Hill Country’s famous sour pickles. Generous sides of French Fries, Buttermilk Biscuits, and Mac & Cheese are also available to complete the meal. Generous-hearted Nickie Chapa, a longtime friend of Hill Country founder Marc Glosserman’s family, is legendary for the homemade holiday tamales she would send across the country to loved ones during the holidays. Capturing that spirit of home-cooked hospitality is Nickie’s Mex-Tex, offering comforting dishes like tamales, the “El Guapo Burger” made with a house brisket-short rib blend, and tacos like the “El Pastor” featuring pulled pork with roasted pineapple, red onion, and cilantro. Nickie’s also features frozen margaritas to pair perfectly with any Mex-Tex favorite. Lovingly nicknamed, SoCo, and steeped in the laid-back tradition of Austin coffee houses, South Congress offers fuel for the day with delicious breakfast options. In partnership with New York-local roasters City of Saints, South Congress provides broad coffee and espresso options alongside breakfast tacos, fresh fruit and yogurt, as well as daily selections from the innovative Du’s Donuts. For the sweet tooth, South Congress also features daily options from Van Leeuwen Artisan Ice Cream in scoops, shakes, and sundaes throughout the day.